After giving a quick look at French actor/writer/director Jacques Tati's early films, those new to his work could easily think he should be slotted alongside classic silent-comedy stars like Harold Lloyd, Buster Keaton and Charlie Chaplin, as his abilities as a mime and with physical comedy, as well as the bemused quality of his characters fit that mold very well. However, Tati worked in a world of "talkies", even if you barely needed to understand a word spoken to really enjoy his movies, which frequently used society's obsession on progress, innovation and technology as a target for his comedy and commentary. His characters are old-school and struggle with change, but the movies aren't laughing at them. They serve to show the problems found in forgetting the past. One of the things that set Tati apart from the earlier greats was his ability as a filmmaker. Not to take anything away from pioneers like Lloyd and Keaton, who were masters at pulling off a gag for the camera, but Tati's artistry was on another level, as he crafted beautiful imagery to go along with his comedy, culminating in his masterwork, the stunning PlayTime, which brought together all the skill he showed in his brief, but impressive filmmaking career, in one mammoth, misunderstood spectacle that downplayed his most popular creation and offered a beautiful meditation on modern life. 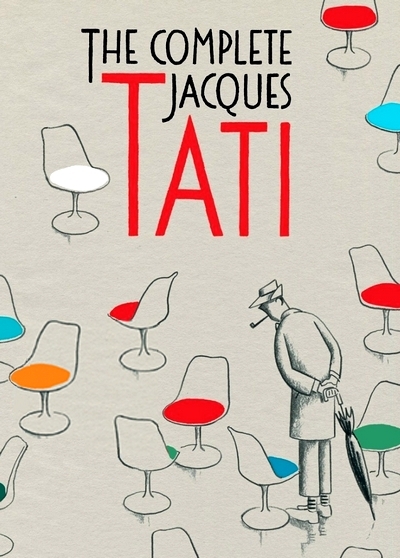 For this collection, Criterion gathered together the Tati films they've released over the years -- Mon Oncle, M. Hulot's Holiday, PlayTime and Trafic -- and filled in the gaps with the first feature he directed, Jour de Fete, the last film he made, Parade and a disc of Tati-related shorts, to create a rather complete overview of the man's career, adding in a smorgasbord of extras to rise it pass complete to ultimate. ••• Jour de Fete. A hapless small town postman (Jacques Tati) watches a film on the modern U.S. postal system during the town's fair. Recognizing the brilliance of the modern system, our hero decides to incorporate their techniques with hilarious results. ••• M. Hulot's Holiday. Monsieur Hulot attempts to vacation at a small, seaside village. Despite his best intentions, he constantly finds himself wreaking some comedic form of havoc. ••• Mon Oncle. Rather than the French seaside, M. Hulot finds himself in a new suburb of Paris, baffled by modern everything, from technology to architecture. ••• Playtime. M. Hulot finally finds himself in Paris proper, navigating environments from the Orly airport to an ultra-modern high-rise and a bustling restaurant. ••• Trafic. M. Hulot travels to an automotive exhibition and struggles along the way to deal with gadgets and cars. ••• Parade. Filmed for Swedish television, Tati plays a clown who gives us backstage access to the world of the circus. •• On demande on brut (1934, 25:01) stars Tati (who also writes but does not direct) in a film about a young man who has to pretend he's a wrestler. •• Gai dimanche (1935, 21:31) is Tati's directorial debut (though he co-directed it with Jacques Berr), as he and a friend start a low-rent tour company offering their unique perspective on leisure. •• Soigne ton gauche (1936, 13:23) is again written by Tati and finds him as a comedic fantasy boxer. •• L'ecole de facteurs (The School for Postmen) (1946, 16:05) finds Tati working on the character who would eventually appear in Jour de Fete. •• Cours du soir (1967, 28:36) is ostensibly a lesson in mime from Tati, but really it's an excuse for the actor to recreate the vaudeville-style act that made him famous initially. •• Degustation maison (1978, 13:58) is a film by Tati's daughter that returns us to the town featured in Jour de Fete. •• Forza Bastia (1978, 27:37) is a documentary about soccer started by Tati and finished by his daughter. Perhaps one day you will treat us to the DVDs? That's really terrific. Happy New Year to you. Thank you. I'm just wondering if you forgot about the shorts. I am sorry to keep you waiting. Your hard work and generosity are very much appreciated. It's well worth the wait. Thank you. Why are the last links always direct to wcrpyt? Jdownloader cannot even download them. Is there any other download manager capable of handling these links? Is it so difficult to download one link using a browser? You can use the IDM or IDA. That's beacause my connexion here is really terrible, very unstable, which makes difficult to download through the browser, specially if the link is too big. Both those programs you mentioned they do work with wcrypt? They integrates with the browser, replacing the standard download modules. They do not care from where to download. And they also integatre with the file hosters, like Datafile? Have you ever used download manager? After clicking "Download" in the browser IDM intercepts the link and start downloading in multiple threads. Internet Download Manager and Internet Download Accelerator resume broken downloads. Thanks the tip, pal, I am going to test those other 2. Keep up with the good job on the site! Terrific material by indeed. What's the problem? Links are alive. Unfortunately, anytime I apply a link for Upstore it reads "404 Not found"...same problem when I go to upstore.net. Any ideas? Perhaps you are using a proxy or your IP in a black list on Upstore. Soon I will upload these files to hitfile.